Mirepoix – for those that love their vegetables! 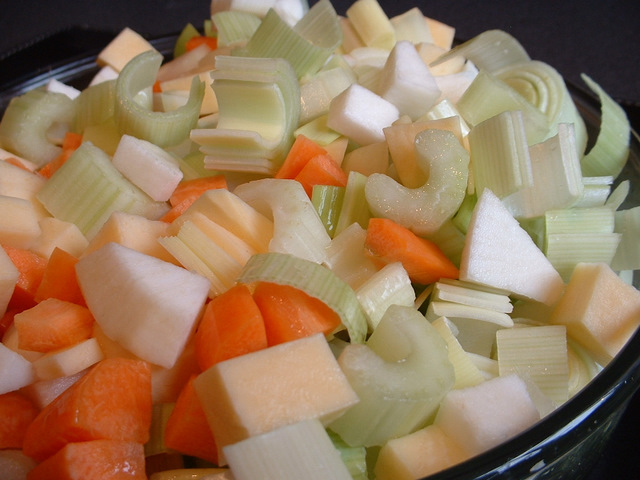 A mirepoix of vegetables is simply a mixture of quite large diced vegetables such as onions, leeks, carrots, celery, etc. A vegetable mirepoix is easy and quick to make and can be used in a wide range of vegetable dishes. A macedoine of vegetables is very much the same as mirepoix, but the vegetables are cut into a much smaller and neater dice shape. The following recipes specifically use a mirepoix of vegetables, although you could use this in many other cases.